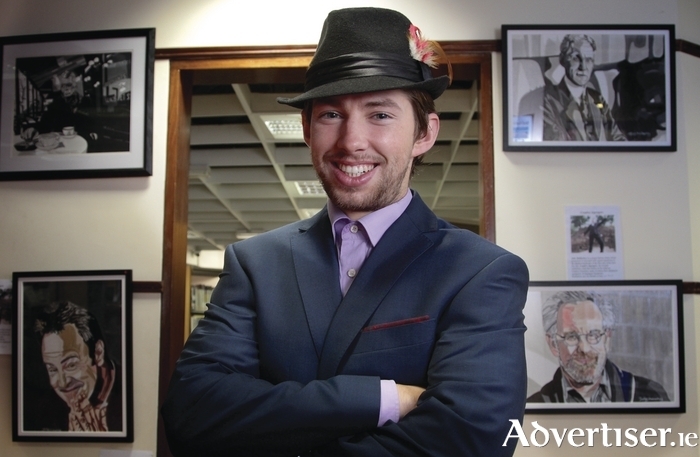 CREATIVE ASPERGER'S is the title of a fascinating art exhibition currently running in the Galway City Library comprising portraits of famous individuals who display signs of Asperger syndrome. The work is by Jody Mullarkey who himself has Asperger syndrome and thus brings a keen personal appreciation and insight into his portrayals of the featured personalities. Asperger syndrome is an autism spectrum disorder that is characterized by difficulties in social interaction and nonverbal communication, alongside restricted and repetitive patterns of behaviour and interests. It differs from other autism spectrum disorders by its relative preservation of linguistic and cognitive development. An inability to be dishonest is another notable aspect of people with Asperger’s. The syndrome is named after the Austrian pediatrician Hans Asperger, who, in 1944, studied and described children in his practice who lacked nonverbal communication skills, demonstrated limited empathy with their peers, and were physically clumsy. Asperger's achieved wider public awareness a few years ago with the publication of Mark Haddon’s multi-award-winning novel The Curious Incident of the Dog in the Night Time, the narrator of which is a teenager who has the syndrome. Jody is certainly not afraid to pursue his dreams or be himself. Most people will know him from busking on Shop Street where he is a familiar presence, clad in a gray suit and belting out standards like ‘Dancing in the Dark’ and ‘(Everything I Do ) I Do It For You’. Alongside the music, art also figures strongly in Jody’s CV and Creative Aspergers is his seventh exhibition. Art indeed figures strongly in the Mullarkey family. Jody’s father, Jim, has published a collection of stories with Doire Press, his mother Holly is an art teacher and ceramic artist, his sister Anna plays and writes songs with My Fellow Sponges and another sister, Mia, is a film-maker. Small wonder then that Jody should also be highly creative. Lest one doubts Jody’s assessment of these feted writers, it is backed up by leading psychiatrist Dr Michael Fitzgerald, who officially launched the exhibition. An acknowledged expert on autism, Fitzgerald is co-author of Unstoppable Brilliance; Irish Genius and Asperger’s Syndrome which contends that Padraic Pearse, Eamon de Valera, and Jonathan Swift, among others, showed Asperger symptoms like obsessional interests and misinterpretation of social cues. Swift used to run obsessively up and down the stairs of St Patrick’s Cathedral to get fit while Yeats did poorly at school and later had great difficulty in accepting his rejection by Maud Gonne. In his opening speech at the exhibition, Fitzgerald stated that when a family has a member with Asperger’s, “the family have to go on a journey with the person who has Asperger syndrome and not force them on our journey". In his portraits, Jody treats the face like a landscape. While some of the pictures replicate familiar photographic images of his subjects, the strongest works in the exhibition are striking studies of figures like Bill Gates, Hans Christian Andersen, and Steven Spielberg which are bold and stylistically distinctive. There is also a fine portrait of his mother, Holly, in the same style. He describes the technique he used for these; “A lot of them are done with ProMarker on foam board, it makes a watercolour-like effect which has a lovely subtlety. It’s like a marker but it creates an artistic beauty. I’ve done a few actual watercolour paintings, such as one of Sean O’Casey, and it looks quite a lot like the ProMarker and working with it is similar as well. I used foam board because that is the only material that will absorb the ink. I’d done a little bit of work with ProMarker before. It’s good fun using it. Creative Aspergers continues at Galway City Library, Hynes Building, until the end of August.